Last night, I said goodbye to a dear friend. Bottle 3377/3432 of Four Roses 2009 Mariage Edition gave it’s last full measure of devotion for my drinking enjoyment. It was a bittersweet moment for me. The 2009 Mariage Edition, a blend of three of the distillery’s ten bourbon recipes, was a spicy and powerful bottle weighing in at a tongue tingling 54.8% abv (109.6 proof). A little 10 year OBSK, a little 19 year OBSK, and a little 10 year OESO produced a bottle full of cherries, citrus, caramel, toffee, and dry oak. Why am I going on and on about this particular bottle? Because it was the my first bottle of truly high-end bourbon. It opened my eyes to all that bourbon could be. It taught me that you don’t have to bury your bourbon under a glass of Coke or hide it behind a ton of mint and syrup (though those are perfectly valid beverage choices). I have become such a fan of Four Roses bourbon that my Pretty Little Wife bought me an antique cut crystal Four Roses bottle for my birthday. 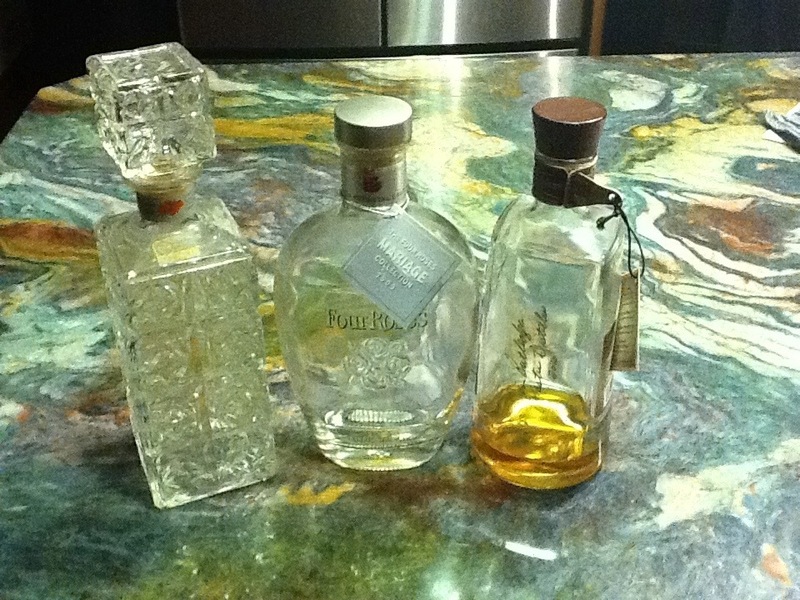 I even tracked down four more bottles of the 2009 Mariage Edition to give to my groomsmen (a story for another day). So what’s the story behind the Four Roses? The Four Roses brand first appeared in the late 1880s, though their iconic Lawrenceburg, Kentucky, distillery wasn’t built until 1910. The brand was originally owned by the Frankfort Distilling Company and was likely named for company founder Rufus Matheson Rose, his brother, and their two sons. Through the 30s, 40s, and 50s, Four Roses Kentucky Straight Bourbon Whiskey was the top bourbon brand in the United States. Canadian beverage behemoth Seagram purchased the brand in 1943 and, in the late 50s, discontinued the sale of Four Roses bourbon in the US in order to focus on blended whiskeys. They continued to sell Four Roses overseas, but we Americans had to wait for the brand to change hands again in 2002 to see Four Roses bourbon return home. The brand is currently owned by Kirin (the Japanese beer people). Bourbon Hall of Fame honoree Jim Rutledge has been the Four Roses Master Distiller since 1995. Ultimately, I suppose I have him to thank for my bourbon obsession (and my PLW to thank for getting his autograph on the side of a Four Roses Single Barrel bottle when he was in Dallas a whole back). He weaves the distillery’s ten bourbon recipes (two mash bills combined with five strains of yeast) into the spirits that haunt the dreams of every bourbon enthusiast. I’ll miss my dear friend bottle 3377/3432, but I won’t spend too much time mourning its passing. After all, I still have bottle 2824/3432 sitting unopened on my shelf (you didn’t think I’d buy four bottles for my friends and not get one for myself, did you?). And right next to that is bottle 3121/3491 of the 2008 Mariage Edition. And next month, Jim Rutledge will be unveiling the 2011 Four Roses Limited Edition Small Batch (as the Mariage Editions are now known) at the Kentucky Bourbon Festival. Jim, if you’re reading this, I’ll be back in the Bluegrass at Christmastime. Could you save me a bottle? This entry was posted in My Bourbon Shelf and tagged Four Roses, history, pretty little wife. Bookmark the permalink.